When you are a kid, nothing quite beats Christmas. For me, Christmas was magical and yet I was always aware of the holiness and importance of the holiday. Now, with children of my own, Christmas holds so much of the same promise, hope, and excitement. Mountains of toys are alluring, but the birth of Christ is truly worth celebrating. Baking. Making, eating, and sharing cookies, cakes and all other kinds of goodies says “Merry Christmas” to me. Stockings. Some families don’t partake of the stocking tradition, but I love it. I love finding fun, interesting, and unique stocking stuffers, especially for my kiddos. Midnight mass. My grandmother is Catholic and that meant every Christmas we attended midnight mass. This was a magical and holy event to me as a child. I was put to bed, only to be awakened at what felt like the middle of the night. My mother and my aunts would be readying themselves in the dark quiet house. We would then head towards the church, which would be filled to brim with worshipers. Each Christmas Eve mass, I would watch and listen in wonder as they reenacted the Nativity. The church doors would be pounded upon as Mary and Joseph were searching for a place to rest their head. The lone donkey, loaded with the mother, would slowly plod down the center aisle. Eventually, a baby would appear–a real infant–and they would all gather around and worship Him, thanking God for the Messiah. 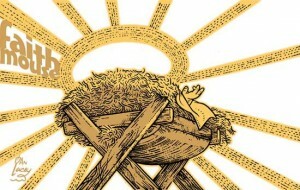 Nothing will ever replace my memories of midnight mass and watching the birth of Jesus come to life. 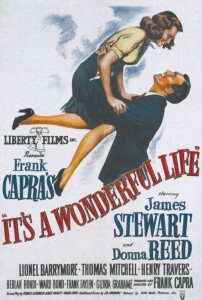 It’s Wonderful Life. I watched this movie for the first time two years ago. As it ended, I sat quietly crying. It is a perfect movie and also happens to be a Christmas film. “Real” elves. My family would draw elaborate pictures of elves on pieces of paper and then place them in the Christmas tree. They told me as a child that the elves would freeze whenever someone was looking at them, thus explaining why they didn’t “move.” As soon as I would walk away, however, my family would move the elves, so that as I returned, I was flabbergasted and in awe, thinking that the elves had really moved all on their own. Christmas music. I love it all, from traditional and religious Christmas music like O Holy Night to Nat King Cole’s Have Yourself a Merry Little Christmas. Christmas music is pure joy to me and I never tire of it–just don’t start playing it until after Thanksgiving. Giving. They say giving is better than receiving, and I agree. 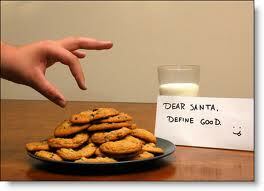 Although Christmas shouldn’t be the only season in which we give generously and freely. Watching my kids open presents. Hysteria and raw happiness in two small packages (my kids, not the actual presents). Our Lord. Remembering Christ and thanking Him for His sacrifice, and His willingness to come to earth as an infant, knowing He would eventually die for us all… “who, although He existed in the form of God, did not regard equality with God a thing to be grasped, but emptied Himself, taking the form of a bond-servant, and being made in the likeness of men. Being found in appearance as a man, He humbled Himself by becoming obedient to the point of death, even death on a cross.” Philippians 2:6-8. Okay, you know the drill… What are your Favorite Christmas Things? What traditions do you love? Or, what are some things about Christmas that you could do without? The first thing I like about Christmas is being able to spend so much time at my parent’s house. My younger sister and brother still live there (because they are still young), so it is great staying the week there and being around the family again. The second thing I like about Christmas is decorating the cookies. For some reason I associate frosting with Christmas and the childhood memories flood in. We are a handful of creative, imaginative people in my family so Santa’s hats are always some crazy color like orange or green and the snowmen are never white like snow. The third thing I like about Christmas is all of the great, delicious food my mother makes. She makes cookies, all sorts of sweets. But my ALL-TIME FAVORITE is the tradition we have where my mom makes cinnamon rolls with walnuts on Christmas morning. We open presents for about an hour and then eat some amazing cinnamon rolls, then get back to opening presents again. The fourth thing I like about Christmas is the traditions we have within the family, which I am pretty sure I am going to do in my family when I have one someday. One of our traditions is the youngest one picks the first present to open and it can be for anyone. The first present opener opens their present while we all watch and get excited with them and then that person picks the next present. We continue like that until all of the presents are gone. I feel like there is more bonding within the family like that instead of everyone diving in, finding their presents, ripping everything open, and then going into their own corner to splurge on all their gifts. the smell of a fresh pine tree. “Oh Holy night” sung with a simple finger-picked accoustic guitar. Giving. Family. Remembering the worlds first Miracle baby… and where His journey would end. Reading the christmas story and reflecting on it BEFORE opening gifts. Expecting little to nothing but always being thrilled and surprised with the gifts. Family. I love Christmas. So much that it’s hard to be sad this week when I should be. Our house is all decorated and happy, my kids are excited. Favorite things Christmas edition is hard to pick! Getting up at 2am for gifts. Every year, I woke up at 2-3am and convinced my younger sister to up up up and wake the parents, digging into our piles of gifts! When we became grown ups, until she moved away we still decended upon their house at 2am, dragging our children out into the night for coffee and presents. I miss that but we still get up before dawn here. The extravagence! We did ok growing up, you know? But never a TON of extras. On Christmas morning though, our living room was filled. Only after I became an adult did I realize how my dad would work extra shifts and my parents would scrimp to provide for that INCREDIBLE array of presents. Bikes, tvs, stereos, desks, jewelry — they tried very hard over the years to use Christmas as a time to buy us our hearts desire. I <3 them for it. Peace. No one ever fights on Christmas. It's awesome. And my most favorite thing about Christmas — people expect you to talk about God. Thruout the rest of the yr, people get a little collar-too-tight when you start spouting poetic about Jesus, but for this small frame of time, I can be happy and in love with Him aloud to other ppl without ticking them off! I love that you have such wonderful childhood memories of Christmas. And you are right, more and more people are open to hearing about God during the holidays. I think some of it is because people feel lonely between November and January and they are seeking and searching for hope and love. Jesus is of course, the answer and their ears are more posed to hear it. I hope your Christmas is blessed Ade and filled with God’s peace and His promises. Children opening presents- I love it so much! Making new family traditions, with my own little family. It is so strange to be on our own now. I still can’t believe I’m all grown up, married with two children, and starting our own traditions. Like, on day Capri will be grown up remember here childhood memories, and they are what is going on right now… so crazy to me! Next Next post: Is There Really a War on Christmas?